What And Where Is The Hydrosphere? 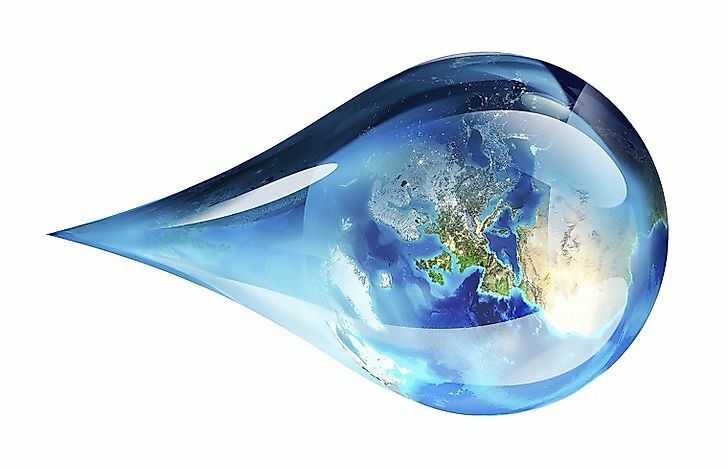 The hydrosphere is the "water world" found collectively above, below, and directly upon the earth's land surfaces. Our Earth is truly a "Water World". As per the definition as it is used in physical geography, the hydrosphere is the collective mass of water found on, over, and under the Earth’s surface. It includes both the marine and freshwater resources of the planet, and encompasses oceans, rivers, lakes, glaciers, polar ice caps, clouds, underground water such as aquifers, and all other sources of water. The presence of the vast hydrosphere distinguishes planet Earth from other planets in the solar system, and is one of the primary factors responsible for sustaining the life seen on Earth. Oceans comprise 97.25% of the total water mass on the Earth’s surface, followed by ice caps and glaciers (2.05%), deep groundwater (0.38%), and shallow groundwater (0.30%). Lakes and rivers, moisture trapped in soils, and water vapor in the atmosphere, as well as water contained within living organisms of the biosphere, are the other constituents of the Earth’s hydrosphere. The Earth’s water content is relatively much higher than that of any of the other known planetary bodies of similar size. Though "outgassing" of water vapor from the Earth’s interior is considered as one of the sources of water on this planet, it cannot account for the exceedingly high volumes of the Earth’s water resources. As per the most popularly accepted scientific theory on the matter, water on Earth was added to by the collision of this planet with several water-rich asteroids, comets, and other water bearing planetary bodies at the time of formation of the Earth. The waters of the hydrosphere are never static, but are instead in a constant motion that leads to the exchange of water between the Earth’s oceans, rivers and lakes, the atmosphere, lithosphere, and biosphere. This movement of water within the Earth’s hydrosphere is known as the "water cycle", or "hydrologic cycle". Evaporation exceeds precipitation above the oceans, with much of the evaporated water being carried to land where it condenses and precipitates as rainfall or snowfall, and subsequently either seeps underground or flows into rivers or is collected in ice caps and glaciers. The snowmelt run-off from ice caps and glaciers enters the rivers and the waters of the river and the underground water, finally again draining into the oceans, completing the water cycle. Water absorbed by the plants of the biosphere from the groundwater is added to the atmosphere via transpiration from their leaves, which again becomes part of the water cycle. Life on Earth without the hydrosphere is unimaginable. An active hydrosphere is necessary for all life forms to exist, multiply, and grow. All life-sustaining biochemical reactions require water as a solvent. The water cycle of the hydrosphere is responsible for providing an abundant supply of clean, fresh water to all living beings on Earth. The extreme importance of the hydrosphere in supporting life is reflected in the fact that the search for life on other planets always begins with a search for water on those same planets. Currently, the activities of modern human society continue to have an extremely detrimental effect on the Earth’s hydrosphere. Eutrophication, acid rain, and global warming are the three major threats to the hydrosphere in the modern world, and each are explained below. Human activities lead to the accumulation of excessive nutrients (phosphate and nutrients from fertilizer run-offs) and organic matter (from sewage) into the hydrosphere, triggering an outburst of algae and plankton growth, making the waters highly turbid and killing off fishes and other aquatic species at the depths of water bodies due to the low availability of oxygen. This phenomenon is called eutrophication. Acid precipitation is generated by the emission of sulfur dioxide and nitrogen oxides into the atmosphere by fossil fuel burning. The precipitation that falls is acidic in nature, and corrodes buildings and constructions, and renders the world’s water resources acidic and thus unsupportive of life, and increases the leaching of other metals into the acidic water. Though acidic precipitation and eutrophication activities are localized to numerous water bodies across the globe, greenhouse gas emissions are affecting the entire hydrosphere of the world as a whole. The rise in temperature is increasing the rate of evaporation from the world’s rivers, oceans and lakes, melting the glaciers and polar ice caps, raising sea levels around the world, and creating an overall disturbance and misbalance within the Earth’s hydrosphere and the other Earth systems dependent upon it.